Explore the benefits, start down the road to certification, and maintain your certification. It is easier than ever to find and earn your CM credits. The Events list on the homepage includes CM programs offered by APA - Wisconsin. Or search for programs through the CM search engine at APA National. The AICP credential communicates your professionalism and commitment to continuing to develop your skills and capacities as a planner. Explore the advantages to you as an individual, learn about the process of earning your AICP certification, and connect to resources to maintain your certfication. The Chapter Professional Development Officer, Nancy Frank, is available to answer questions and help you find answers to questions about AICP and CM. Contact her by email at frankn@uwm.edu. 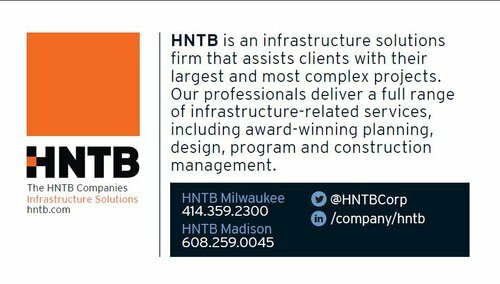 Thank you to one of our generous sponsors, HNTB. View links to APA - Wisconsin sponsored programming. This can help you find programs that fit your schedule and budget. If you have trouble finding an APA - Wisconsin program that you have already attended, the links on this page may help you to find the program to add to your CM log. The National Planning Conference is another great way to earn your CM credits while meeting planners from across the country.